Frankfurt am Main and Hamburg are the model regions in this research collaboration. Within these regions, applied research and actions are focussing on urban areas, where existing water infrastructures have to be considered for the transformation process. In the Salvador-Allende-Straße, district Bockenheim, a passive house with about 70 apartments and a day care centre is under construction. 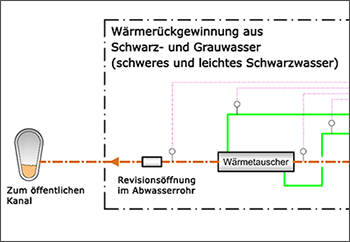 Heat recovery from wastewater is implemented and tested as a measure of the energetic optimisation of the apartment block (figure 1). Additionally, reuse of treated greywater for toilet flushing is applied in one half of the building. In addition, implementations for other neighbourhoods are investigated at planning level. In Hamburg suitable model regions/neighbourhoods will be identified, checked for their transformation ability and investigated in terms of their technical feasibility and impact on the whole system of the Hamburg sewage network and wastewater treatment. For this, technical and economic data on water, energy and material flows of water infrastructure systems are compiled, processed, modeled and analysed. The emphasis is on considerations concerning the conversion and development of existing neighbourhoods and their chronological progression.